One of the trains in the Amtrak Cascades service at Albany Station in July 2016. 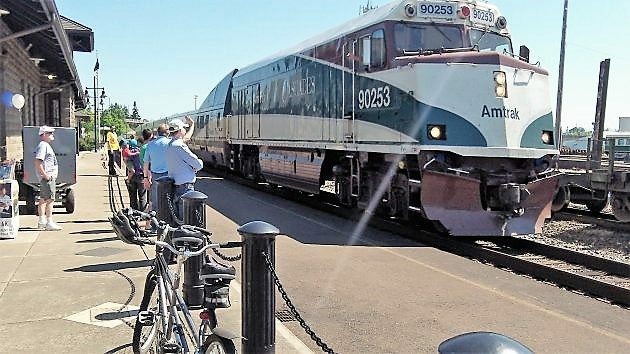 The planning process for improved passenger train service between Eugene and Portland, via Albany and Salem, started in 2012. Now ODOT and the Federal Railroad Administration have published the draft of an environmental impact statement. The preferred alternative, No. 1 in the draft, would add two round trips a day on the existing route, using the Union Pacific tracks up and down the valley, and improving the track as necessary to accommodate increased passenger and freight traffic. The other alternative, No. 2, would run the passenger trains on a new track up I-5. An option in No. 2 would include a detour to central Albany to allow continued use of the restored historic Albany Station. As for the cost, the draft includes rough estimates in 2015 dollars. The price for construction plus new trains and track overhauls would be roughly $1 billion for using the existing route, Alternative 1. For Alternative 2, the route along the freeway, the total estimate runs from $3.7 billion to nearly $4.5 billion. Time to start looking into a hyperloop. Probably much cheaper and quicker in the long run. Our public officials are stuck in the past and don’t look towards the future. 3.7 billion for old and slow technology, Wow! What in heck is hyperloop? First rule of jounalism to explain yourself in your first few sentences. Hasso, you’re so 19th century when our grandchildren will live in the 21st. Time to dream instead of trying to hold on to the past. I’m old. you’re old. You need to get out of the way of progress, Face it, both of us will be dead relatively soon. Had to look that up. A sealed “car” inside a sealed, partially-evacuated tube, driven by a railgun. Able to reach high speeds with low power because there’s not much friction in vacuum. Developmental concept that’s opposed by traditionalists. As someone who loves European rail systems, and has enjoyed them many times, I recognize the serious lacking of infrastructure for public transportation that exists in Oregon. I think Portland is moving in the right direction, and Corvallis/Eugene are also working on it, but with the minimalist approach to our local bus systems in Albany, let alone the tragic amount of daily trips north on the rails it’s no surprise that local public transportation isn’t more popular…yet. Most of my friends and myself would love to use public transportation instead of a vehicle. But there are simply not enough routes and too few hours that they’re in service. If we want public transportation to actually make a difference in the US then we have to be willing to make a serious investment in the future NOW, as most of Europe had to. As it is, with our loves of cars and our unwillingness to invest in public transportation, we’re better off all buying Electric cars and taking to cycling if we want to increase our environmental sustainability. What I don’t think most of the public realizes is just how much the younger generation would use public transit, if we had a system worth utilizing. The government has spent a trillion or so in Afghanistan alone and look what that’s gotten you. $5-billion on a train sounds like jobs for Americans, in America. It should be Trump’s MAGA chant for all the infrastructure improving it would entail. History is written by the winners. The Taliban seem not to care a wit for US might. Like the Soviets, we will leave and things will go back to normal. In this case the historical record will clearly show that for a pittance of a new rail line, we could be using high speed rail, etc. Just saying. I can’t believe your last statement. How many billions have been wasted on light rail, wind energy, solar power, etc. Look at the rail fiasco in California which will easily cost 250 billion before it is complete and will have limited ridership because you will end up in LA or Frisco 30 miles or better from where you want to be. Uuuh, wouldn’t adding bus routes make more sense? Or even subsidizing one of the existing shuttle services to add a couple of runs? Train service just to have train service on what is basically a local run seems less than reasonable. So, heavy rail can be efficient at moving people and freight. Problem is that it no longer serves where the people and freight need to go. Those destinations have moved. Instead of warehouse districts with traincars and local cartage, we have company-owned distribution centers strategically placed to minimize cost. Folks can debate the reasons for decline. The fact is that except for heavy-haul in bulk (unit trains of coal, ore, etc) and military needs, the dinosaur no longer fits the bill. I love taking the train, but they need to make local trips between Eugene/Albany/Salem/Portland more affordable for the average person. At the current cost, train trips can be nothing more than a luxury treat on special occasions. For two adults round-trip from Albany to Eugene it costs $60. For the same amount we can buy 2+ tanks of gas. Our Cruze eco on a good day can get 50 mpg…so we add to the road congestion driving to Eugene. Unless the trip price is lowered, it is doubtful ridership will increase, no matter how much they throw at infrastructure. Elevated guideway at 180 mph would be faster, cheaper and produce no air pollution since it runs on light energy. $200,000 per mile construction cost. Basically an updated version of noisy “el” trains of my childhood, using “light rail”. Generally electric powered. The longlines I’ve ridden cruise at 60ish.